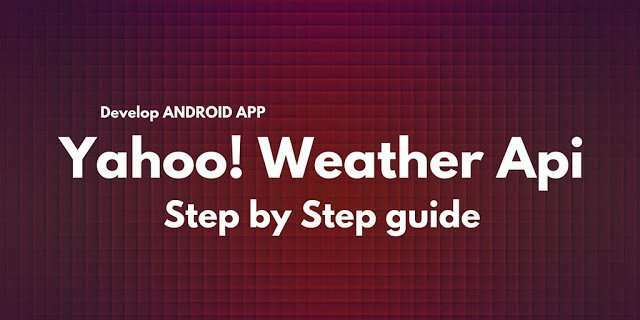 This post is the first of a series where we will explore how to use Yahoo weather provider and get weather information using Yahoo Weather API. Our goal is building an app that gives us the actual weather condition using yahoo weather provider. In the next post we will see how to build a complete app using the knowledges described in this post. We already talked about other weather provider like openweathermap, in other two post. You can give a look here and here if you are interested. The first step to get weather information is retrieving woeid. This a spatial id that yahoo uses to identify city/region. We have, then, to find a way to get this woeid from the city name entered by the user. If you use this api in your browser you will get an XML file with a list of information about cities that match the city_name_pattern. then, we start parsing the data, looking for some tags we are interested on. By now, considering our data model too, we are just interested on the woeid, city name and country. There are other information in the XML but we don’t want to extract them by now. The code below is very simple, at line 1 we simply get the first XML event and we start traversing the XML document until we reach the end. At the method end, we have a list of cities with the woied that is the information we were looking for. At line 4, we implement our Filter, that has two other methods we have to implement. In performFiltering method we make the HTTP call and retrieve the data (line 12). Apparently we could have ANR problem, and we know very well we shouldn’t do an HTTP call in the main thread. But if you read the documentation about performFiltering you will find out that this method runs in a separate thread so we won’t have any problem. In the next post we will retrieve weather information using the woied, so stay tuned! Can you send me the error you get and what city are u looking for? Is it possible the city doesn’t exist? Do you get the same error every type of search? Let me know! hello thanks for sharing I made it for eclipse but I have some trouble to get information from the cities here is the code upload:https://github.com/jimztercrack/SinartWeather2.git if someone can help me thanks in advance. Can you send me the error you get and what city are u looking for? Is it possible the city doesn't exist? Do you get the same error every type of search? Let me know! Yesterday I created my Yahoo application. Its link looks like this: https://developer.yahoo.com/apps/ABCDEFGH/ , is ABCDEFGH the appid? Then I had tried to link to http://where.yahooapis.com/v1/places.q(novosibirsk);count=10?appid=ABCDEFGH … (like in your post), but my browser printed “Page not found”. Can you give me some advice? What I did wrong? 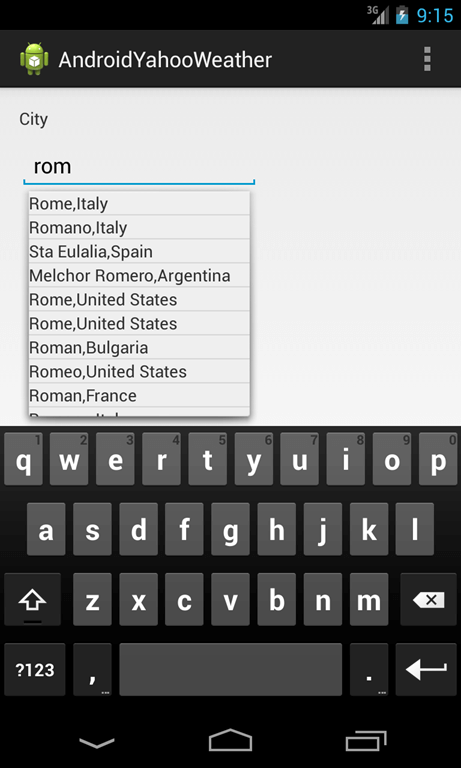 And I want to get all city names and woeids supported by Yahoo, is it possible to do it by Yahoo API? Yesterday I created my Yahoo application. Its link looks like this: https://developer.yahoo.com/apps/ABCDEFGH/ , is ABCDEFGH the appid? Then I had tried to link to http://where.yahooapis.com/v1/places.q(novosibirsk);count=10?appid=ABCDEFGH … (like in your post), but my browser printed “Page not found”. Can you give me some advice? What I did wrong?And I want to get all city names and woeids supported by Yahoo, is it possible to do it by Yahoo API?